This dish was a new one for my family! It is surely a sweet and satisfying side dish. This casserole disappeared quite quickly when I served it. 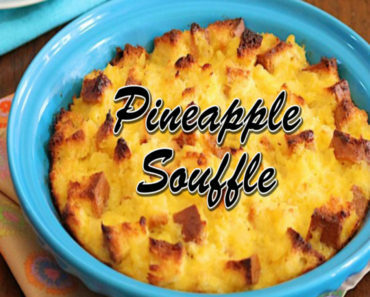 The pineapple souffle engaged the whole family when we tried to decide which category would suit it best. It could be a dessert, or a side dish. It could be served with ham or alone as a dessert! Very rich and tasty for sure! Preheat oven to 350 degrees. In a large bowl, cream butter and sugar until light and fluffy. Add eggs, one at a time, beating well after each addition. Stir in pineapple and lemon juice. Gently fold in bread cubes. Spoon into a greased baking dish. Bake, uncovered, 45 minutes or until top is lightly golden. Serve warm.